Catalyst funding should be used to support focused projects. The focus is on maturing exploratory research further towards applications and operational contexts. These projects may address the corresponding thematic challenges mentioned below in Section2. Other ‘open’ proposals, for projects moving solutions closer towards industry goals and objectives, and towards higher TRLs, will also be considered for catalyst funding, although some priority will be given to those aligned with thematic challenges, as set out below. Proposals supporting a thematic challenge should clearly state with which challenge the proposal is aligned. Cost constraints and submission principles are also described below. The Awards Board is comprised of Engage consortium members, the SESAR Joint Undertaking, ASDA, NEXTOR II and industry partners (without conflicting interests). It is chaired by EUROCONTROL (with a casting vote). Engage consortium members are ineligible to bid for the funding, although they will monitor, support and advise on the corresponding projects. This is the first of two waves of this type of funding. It is not a requirement that any of the proposers has attended an Engage thematic challenge workshop. As stated above, proposals may either support a thematic challenge, or be ‘open’. The thematic challenges are described on the Engage website (www.engagektn.com, see “Thematic challenges” page, listed under “Participate”). Abstracts of the four thematic challenges are as shown below. CNS/ATM components (e.g., ADS-B, SWIM, datalink, Asterix) of the current and future air transport system present vulnerabilities that could be used to perform an ‘attack’. Further investigations are necessary to mitigate these vulnerabilities, moving towards a cyber-resilient system, fully characterising ATM data, its confidentiality, integrity and availability requirements. A better understanding of the safety-security trade-off is required. Additional security assessments for legacy systems are also needed to identify possible mitigating controls in order to improve cyber-resilience without having to replace and refit. Future systems security by design is essential: a new generation of systems architectures and applications should be explored to ensure confidentiality, cyber- resilience, fault tolerance, scalability, efficiency, flexibility and trust among data owners. Collaborative, security-related information exchange is essential to all actors in aviation. This is specially challenging in a multi-stakeholder, multi-system environment such as ATM, where confidentiality and trust are key. Accurate and reliable trajectory prediction (TP) is a fundamental requirement to support trajectory- based operations. Lack of advance information and the mismatch between planned and flown trajectories caused by operational uncertainties from airports, ATC interventions, and ‘hidden’ flight plan data (e.g., cost indexes, take-off weights) are important shortcomings of the present state of the art. New TP approaches, merging and analysing different sources of flight-relevant information, are expected to increase TP robustness and support a seamless transition between tools supporting ATFCM across the planning phases. The exploitation of historical data by means of machine learning, statistical signal processing and causal models could boost TP performance and enhance the TBO paradigm. Specific research domains include machine-learning techniques, the aggregation of probabilistic predictions, and the development of tools for the identification of flow-management ‘hotspots’. These could be integrated into network and trajectory planning tools, leading to enhanced TP. The main objective of this challenge is to improve overall ATM system performance by providing better user-support tools based on improved meteorological (‘met’) products. The focus is on the synergy of several methods and techniques in order to better meet the needs of operational users and to support aviation safety (e.g., through creating early warning systems) and regulation-makers (e.g., moving from text-based to graphical information provision). All stakeholders may benefit from this synergy: ANSPs (e.g., sector reconfiguration and separation provision), airlines (e.g., storm avoidance), airport operators (e.g., airport management under disruptive events), and the Network Manager (e.g., demand-capacity balancing). The challenge is, therefore, to bring the following perspectives closer: (a) for meteorological/atmospheric science, the development of products tailored to ATM stakeholders’ needs, which are unambiguous and easy to interpret; (b) for stakeholders, the identification of the most suitable information available and its integration into planning and decision-making processes. This research explores the design of new allocation markets in ATM, taking into account real stakeholder behaviours. It focuses on designs such as auctions and ‘smart’ contracts for slot and trajectory allocations. It seeks to better predict the actual behaviour of stakeholders, compared with behaviours predicted by normative models, taking into account that decisions are often made in the context of uncertainty. Which mechanisms are more robust against behavioural biases and likely to reach stable and efficient solutions, equitably building on existing SESAR practices? The research will address better modelling and measurement of these effects in ATM, taking account of ‘irrational’ agents such as airline ‘cultures’. A key objective is to contribute to the development of improved tools to better manage the allocation of resources such as slots and trajectories, and incentivising behaviour that benefits the network – for example by investigating the potential of centralised markets and ‘smart’ contract enablers. Further details on each challenge are available on the Engage website as downloadable PDFs. 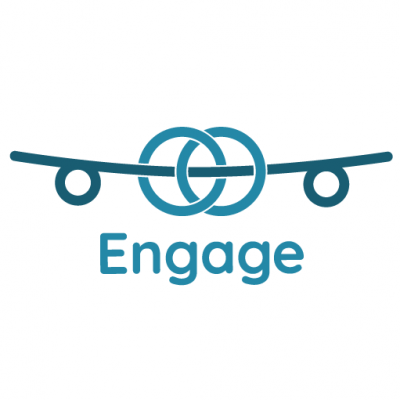 Associated workshops, open to anyone to attend, have been advertised on the Engage website and disseminated through various other channels, including as SESAR e-news items. The workshop for thematic challenge 1 is planned for 2019. Key summaries from the workshops and/or updates from experts will be used to update each PDF on the website. Interested parties are advised to monitor such updates, and an announcement for the thematic challenge 1 workshop, which will also be flagged on the home page of the Engage website in the “Engage news” section. Each thematic challenge will also be presented at the SESAR Innovation Days, hosted by the University of Salzburg during the week of 03-07 December 2018, with a corresponding poster. Proposals may be submitted by a single entity, or a consortium of between two and four entities. Consortia do not need to comprise more than one country to be eligible to receive funding through Horizon 2020 grants. For proposals submitted by a single entity, this entity is the project coordinator. For consortia, one entity in each consortium acts as project coordinator, with the responsibility for submitting the proposal and acting as point of contact with the Engage KTN. The project coordinator role should not be shared between entities. For consortia, funding is allocated to the project coordinator who is responsible for paying the other entities in the consortium. Each entity in a consortium should be located in a country eligible to receive funding through Horizon 2020 grants. Please note that the same eligibility conditions apply to this Call as for the original call for proposals leading to the award of the Engage KTN (refer to ). Funding through this Call is made available as ‘financial support to third parties’ and complies with Article 15 of the Engage KTN Grant Agreement (refer to ). The duration of the project is limited to 12 months. This Call closes on 15 February 2019 at 17:00 (Brussels time). Effort of all parties according to Horizon 2020 rules. The maximum award per proposal is EUR 60 000. In accordance with Article 15, the maximum amount that any third party can receive from the Engage KTN is EUR 60 000 over the duration of the network (please note that this rule does not apply to PhDs and post-graduate theses funded via a separate Call). Refer to the Annex for further guidance. For the avoidance of doubt, this means that no entity can receive more than EUR 60 000 in total from the Engage KTN, from the first or second waves of this Call and including any other KTN funding (except in support of PhDs and post- graduate theses). Entities submitting more than one proposal should be mindful of this constraint. Data and other supporting material costs, including computing infrastructure (e.g., cloud resources). All taxes eligible under Horizon 2020 rules are covered. • Short description of each entity (max 2 pages per entity) with relevance to the topic addressed in the proposal and the ability to execute it. (1) Summary (1 page): a concise overview of the project and its background (with project inputs and any planned outputs that are in addition to those specified in Section 4). (2) Project goals and objectives, either explicitly supporting a specific thematic challenge (as identified in Section 2), or stated as ‘open’. o Provide evidence of co-funding, if applicable; this may be used as evidence to support criterion C(iv) in Table 1, but will not be given explicit weighting in its own right. Note that co-funding is separate and does not contribute towards the EUR 60 000 maximum award per proposal. An optional annex of references may be additionally included. Proposals should be written in a font no smaller than 11-point. Parts (2) – (4) above, inclusive, should comprise 5-8 pages (and no more than this). An optional annex of references will not count towards this page limit. Proposals supporting a thematic challenge should clearly state with which challenge the proposal is aligned. Projects will be encouraged to start promptly, however the starting date cannot be later than 17 May 2019 and funding is not available beyond 12 months. using the subject line “Catalyst Call”. All proposals received before the Call closes will be acknowledged by e-mail. In the event of a failure with the Engage e-mail account, a message will be posted on the catalyst Call page on the KTN website (www.engagektn.com) with alternative submission instructions. Proposals will be evaluated by the Engage Awards Board based on four criteria (Table 1, column C). In order for a proposal to be eligible, each criterion must receive a score higher than, or equal to, the threshold (Table 1, column T). For eligible proposals, the score of each criterion is then weighted (Table 1, column W) to obtain the final score. Eligible proposals are then ranked in decreasing order of the final score. For proposals in the top 75th percentile, which are aligned with a thematic challenge, one project will be awarded per thematic challenge, based on rank order (i.e. with the intention of thus awarding at least one project per thematic challenge). The remaining projects will be awarded in order of rank order alone. It is expected that at least eight projects will be awarded through this Call, although the Engage consortium may award fewer, or more, depending on the quality and complementarity of the proposals, and of the total funding requested (e.g. a significant number of successful co-funded projects would permit a higher number to be awarded). Formal inclusion of industry members in a consortium may be used as evidence supporting criterion (iv), but will not be given explicit weighting in its own right. In all cases, consultation with industry, and industry engagement, is expected in order to attain the score threshold. Each project can start as soon as the agreement is in place between the University of Westminster and the project coordinator. Project progress will be assessed by the Engage Executive Board (Engage consortium members) in relation to the project schedule and milestones in the proposed research plan (Section 3.3.1). Each project will produce three reports: two Progress Reports and a Final Technical Report (further content guidance for these will be provided by the KTN). Project coordinators will submit project reports by e-mail to the University of Westminster, to then be assessed by the Engage Executive Board and shared with the SESAR Joint Undertaking. The Intermediate Progress Report (max ten pages) will be submitted after six months. This will summarise the technical progress made in relation to the project schedule and implementation of criteria (i)-(iv) in Table 1, during the first half the project and expected progress over the second half. The financial situation will also be reported, detailing all eligible costs per entity (if more than one partner) during the first six months to satisfy the release of the first payment. Note that the Intermediate Progress Report should be submitted as soon as possible after the end of month six, but no later than 30 days thereafter. The Final Progress Report will have a similar structure and content as the Intermediate Progress Report. This will summarise technical progress in relation to the project schedule and the financial situation during the final six months to satisfy the release of the second payment (jointly with the Final Technical Report, see below) and should be submitted as soon as possible after the end of the project, but no later than 30 days thereafter. The Final Technical Report will summarise the achieved scientific results, the extent to which the objectives were achieved and how the results helped to increase the maturity towards applied (or industrial) research (with reference to the criteria in Table 1) and will be made public after approval by the KTN. Further content guidance will be provided to projects. The Final Technical Report should be submitted at the end of the project, but no later than 30 days thereafter. Projects are encouraged to disseminate their findings and this will also be supported by the KTN. Note that content from the various projects’ Final Technical Reports will also be published in Engage deliverables. For each project, an agreement will be signed between the University of Westminster (as Engage coordinator) and the project coordinator. This will confirm the compliance of parties to Horizon 2020 rules. Two payments will be made by the University of Westminster to the project coordinator. Payment will be released only after approval has been given by the Engage Executive Board to: (i) the Intermediate Progress Report (after six months), and (ii) the Final Progress Report/Final Technical Report (after 12 months). Note that catalyst-funded projects will not be managed using the EU’s Participant Portal. As mentioned in Section 2, for those wishing to submit a proposal aligned with a thematic challenge, each thematic challenge will also be presented at the SESAR Innovation Days. For questions regarding the submission of proposals, go to the “Contacts” page of the Engage website (www.engagektn.com), and select “Catalyst funding” from the drop-down when submitting your query. We will post these questions (anonymised), and their responses, on a dedicated FAQ page on the Engage website. Interested parties are advised to monitor the FAQ page for clarifications. The last date for questions to be submitted will be 01 February 2019, two weeks before the Call closes. Submission deadline: 15 February 2019 (17:00 Brussels time). Submit proposal to: EngageKTN-coordinator@westminster.ac.uk (using the subject line “Catalyst Call”). o Short description of eachentity. Except for PhDs and post-graduate theses funded through the KTN, the maximum amount that any third party can receive from the Engage KTN is EUR 60 000 over the duration of the network. Third party entities can submit more than one proposal in response to this Call, and can submit proposals to the later second wave, however the aggregate total funding per entity cannot exceed EUR 60 000. All funding received from the Engage KTN (except PhD/post-graduate thesis funding) counts towards the total: catalyst Calls, student travel bursaries and so on. If this maximum is reached, no further funds can be released to the entity. Please be aware of this limit when preparing project proposals. Further funding guidance will be posted in the FAQ section as required.